Unlike a ring or a watch or an old baseball card, a stamp collection is one of the most difficult things to appraise, especially if you have no experience dealing with stamps. Why? A stamp collection can contain thousands upon thousands of stamps, with each one having its own value. With years of experience, one can easily flip through an album containing thousands of stamps and know the value of the album in just minutes. On the other hand, if you have no experience in philately and want to figure out what your stamp collection is worth, you just might be in for some long and grueling nights. With all the research and due diligence that can be done online, you will more then likely come across 20 or so different prices for the same exact stamp. Aside from condition and rarity, which play a factor, stamps like anything else will always be sold for whatever a person is willing to accept or whatever a dealer will pay for them. Without at least 5 good years of experience dealing with stamps, most people will just give up and have a professional appraise it for them. Every dealer has their own way of appraising a collection. Different dealers have different connections in the stamp world. Depending on the type of material you specialized in, you may end up with a few offers that are very far apart from one another. I recently spoke to a gentleman who had his collection appraised for $8500 earlier this year. He had it appraised by an antique dealer that based the value of the collection on catalogue prices as oppose to what he would actually get from the market. After showing his collection to various stamp dealers, he finally heard the same story enough times to believe that you can not value your collection based on catalogue prices! He ended up selling it for $750 to the highest bidder. This dilemma also had a reverse effect with collection of Chinese stamps that sold back in 2007. At the time there was a huge demand for Chinese stamps and collectors in China were willing to pay beyond top dollar for anything Chinese related. The owner was kindly asking for just 15% of the catalogue value for his collection. Now with some countries selling at near 10% of the catalogue value it could seemed like a fair price to ask. The catalogue price for his material was just over $8000 and it sold for $1200 within minutes. At the time some stamps from China were selling for 500% more than the price listed in the catalogues. Unfortunately, he was unaware of current stamp market and sold the collection for approximately $6000 less than what he could have sold it for. If you have a stamp collection that you want to get appraised you have two viable options: Spend a few years learning how to correctly identify your material and the current stamp market or get multiple offers from actual stamp dealers, like ourselves, and take the best offer on the table. i do have a stamp collection , obtained over 40 years of collecting, wondering where in central or northern calif. to get it appraised or how to go about it. i have collected for about 50 years. I have mostly US stamps, but I also have many foreign. My husband is figuring out his stamp collection. His father started it when he was a boy. We have stamps from 1851, Columbian Exposition Commemorative Issue, Pan-American, Louisiana Purchase, Alaska-yukon issue. There is so much, we don’t know where to begin. Any suggestions? Hi Michelle, If you would like to contact me to discuss the matter you can at (619) 672-0434. Or you can visit our FAQ and Sell Your Stamps pages for more info. I have a collection of stamps for many countries that I want to sell. Hi Nick, I have About 40 stamps 40 years old from the US, Korea, Canada, France, New Zealand, Autralia, Hong Kong. My mother inherited a set of Federal Duck stamps, along with his Federal hunting & fishing licenses, from the 1930’s,1940’s, & some from the early 1950’s. She was trying to find a buyer for them in Anchorage, AK, as they were issued in Alaska Territory. Could you reply by my email address above? I would like for her to get the best deal she can find. Thanks. I have old letter said from 1934 that talk about the exchange of the stamps that I also have with the letters. I have foreign and us stamps. Hi: We have a book (32 pages) of beautiful Chinese stamps we would like appraised. None were used as postage. I understand that you include the San Francisco area also for appraisals. I really would like to find out the value of my stamp collection please. Thank you my friend. I have my personal collection of just US issues and possessions,as well as Ducks, I live in southwest MI. I am looking to sell, do you know a reputable dealer in this area? I need to find a person that I can talk to about some old stamps. I am wanting to know the best way to have a stamp collection appraised. I have a collection from around the world and the us. My grandfather lived in various parts of the world during his lifetime and collected while in the us. Primarily stamps from US, Africa, India, Turkey, China and Europe. Hi Nick, I have a collection of canceled stamps and would like to have them appraised. The only guy here, no longer does appraisals. Any suggestions? Thanks for your time! 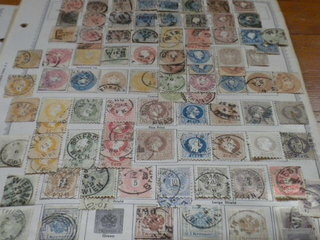 I have old stamps from around the world during WWI… that have been appraised and are worth alot of money. I’m looking for another professional opinion. Yes Sir,most of my home(circa 1905),was destryod from Hurricane Katrina and left a big hole in the roof,This also was a part of the attic I never seen before.Looking Around I found an area with some very old things,one of these things was a box of old stamps,I don’t know much about them until I Googled most of the Stamps.If I can e-mail you pictures of them so you can tell me more,I would appreciate that,Thanks Nick…Joseph C.
I have a few binders of old and rare stamps. A book of different president S. From the 1800s. I’m looking forward to selling these stamps. My family is in a hardship . I feel like these stamps would help us out a lot. The ones I have are from my grandfather’s stamp collection. He started when he 14 yrs old. He passed away 2 yrs ago at the age of 91. He was very unique and the best grandpa ever. Was a very smart man. I need to have a stamp collection appraisal and I’m hoping your firm will do this for me. Some albums were started in the late 50’s and have continued into present day. There are about 24-30 albums to be reviewed. Thank you for your consideration. Hi Keith, please contact us at 619-672-0434 so we cn discuss the collection, thank you. I have thousands upon thousands of stamps from around the world. The majority being pre 1900 U.S. the earliest being 1865 I’d say 300 in the 1865 to 1898 range. Most lightly cancelled. And 5 to 6 hundred from 1898 to The early 60s. Then my knowledge slips. The same time periods in Italian and Mexican, Romanian, Russian, and occupied Italy, many African countries and many more. I am not a collector, as I have too numerous expensive habits already. I would love to sell all. I possess a good number still attached to envelopes as I am afraid they could themselves be part of the value. Please advise. I have an album of stamps of all the presidents weve had .is that worth anything? I have old presidental stamps id like to get apraised. Would you have time for that . maybe only 40 or 50 stamps if that. Thank you. I have a stamp Collection that I’ve had since I was a little boy. I’m 58 now. lol. Different stamps from all over the world. Most are affixed to pages in the original album. I’m looking to get a value and possibly sell them. Any information would be greatly appreciated. The album is “The New Traveler Album” published in 1965. If you have an email address, I could take a few photos for you. Hello Nick, I have a USspecized stamp collection. I have MNH.plate blocks from 1894-2012.Airmails almost complete except for 10issues,11different mint& used Confederates complete 1938Presidental,complete Famous Americans,Liberty Series,Washington Bicentennial HugonotWalloon,all MNH. Plate Blocks of 4-6,imprint strips of 3,plate block of 10 of 294 with inverted wtmk.295 plate block of 6,296 block of 4,285 plate block of 4with imprint All are mint never hinged. #1 on cover with magenta cncl.Newspapers&Special Delerivery. Please contact me at 619-672-0434, thank you.